“Saarcification” has been going on all month in Kathmandu. It all about the upgrades that are underway here as a result of the upcoming SAARC conference which is now just around the corner. SAARC is the acronym for the South Asian Association for Regional Cooperation, and is a kind of EU for the group of eight, South Asian countries, giving them a joint voice and a larger global presence. Nepal is a member, along with Afghanistan, Bangladesh, India, Bhutan, Pakistan, the Maldives and Sri Lanka. They’ll all be showing up here in the next few days, as its Nepal’s turn to host the annual conference and the government has been busy “beautifying” things, essentially to impress the neighbours. 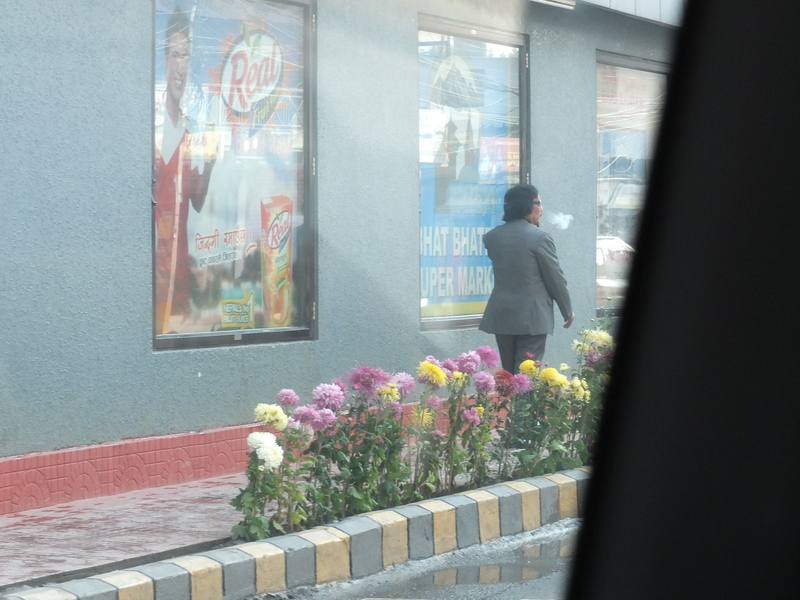 The “beautification” of the city, is a term that I’m hearing over and over again. And it doesn’t sit well with me. Not just because most of the city is a long way from being beautiful, but also because the way things have been carried out. I have mixed feelings on what I’m seeing. On the plus side, its amazing what is happening and the speed at which its all taking place. Suddenly in a city where nothing gets done, everything’s getting done, and its a testament to what an be achieved with conviction, organization and some well-channeled funds. Trees are popping up; a few, highly visible stretches of highway have solar street lighting (there is little street lighting of any kind in the whole city); flowers are being planted, trash is being picked up, and new black tarmac stretches of road are appearing overnight. That’s all a very good thing. And yet there is a pervading sense of scorn in Kathmandu towards all the efforts. Many people feel that the government’s effort is disingenuous, doing so much after doing so little, and doing it to impress others, not its own citizens. The expectations are really low that any of the planted trees or parks will be maintained, or that the trash will be picked up again after its all over. The speedy repairs and plantings are sloppily done. Haphazard painting over unprepared services and poor workmanship mean that much will peel, fall over or generally fall into ruin after pretty much no time at all. The walls that I saw being painted a couple of weeks ago are already caked in dirt or sprayed with graffiti. It doesn’t bode well. 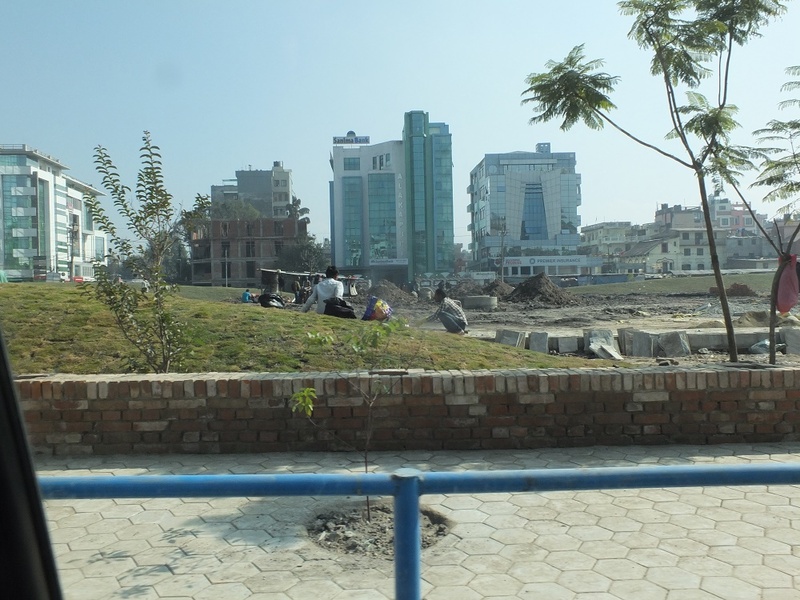 The saarcification of Kathmandu has been fast and sloppy. True beautification would be a long term commitment made by the government–and its people– to plan for its infrastructure, care for its future and preserve the many rich treasures the city already has. This is the most ridiculous thing I’ve seen here: flag poles. 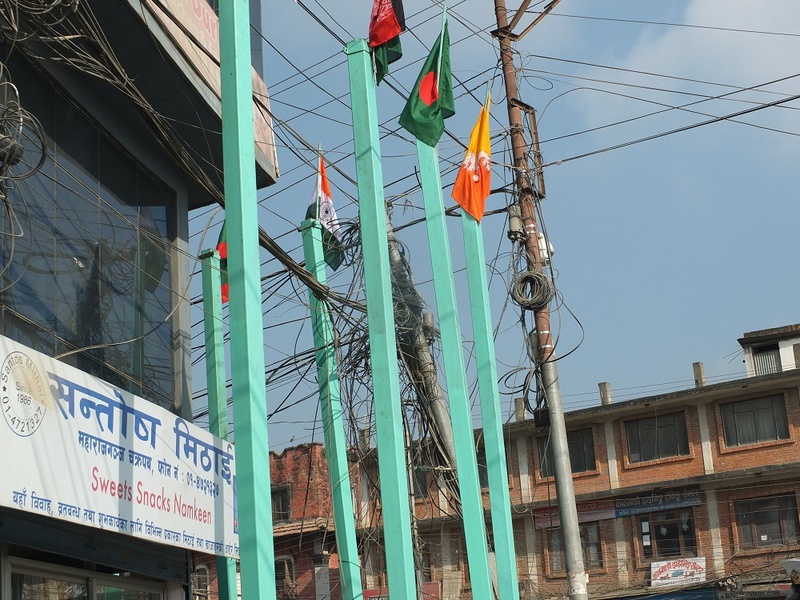 Banks of eight flagpoles (one for each SAARC member flag) have gone up all over the city. They’re a pretty sad effort. The poles aren’t straight, the flags are disproportionately tiny, and they just look ridiculous tucked behind yards of ugly wiring. What a waste of money! This is much more hopeful. Its looks like this park project has been in planning for a long time and — if they do it right — it will be an excellent addition to the local area. They have to finish it though, and someone has to actually water the grass… we will see. And finally, probably the silliest thing I’ve seen. I guess it only has to hold up for a couple of days, but planting 12″ mums in a gap between the curb in the pavement where people cross the road. Really?! Insert big smilie face here.